The best parties have food that both tastes and looks good. We asked food stylist Emily Marshall to create a recipe inspired by art history for our ongoing series on the art of partying, and she’s serving up edible works of art fit for a museum. Josef Albers’ Homage to the Square series, which the artist began in the 1950s, is known for both its visual simplicity and its technical rigor, combining assorted shades and sizes of the simple shape to explore our nuanced perceptions of color. In my line of work, as a food stylist, this kind of exceptionally detailed approach to a seemingly simple task is commonplace. In spite of my profession, I generally don’t exhibit that level of care over how food looks in my daily life. There’s one exception: hors d’oeuvres. I like a very controlled approach to party food and its look on the table. 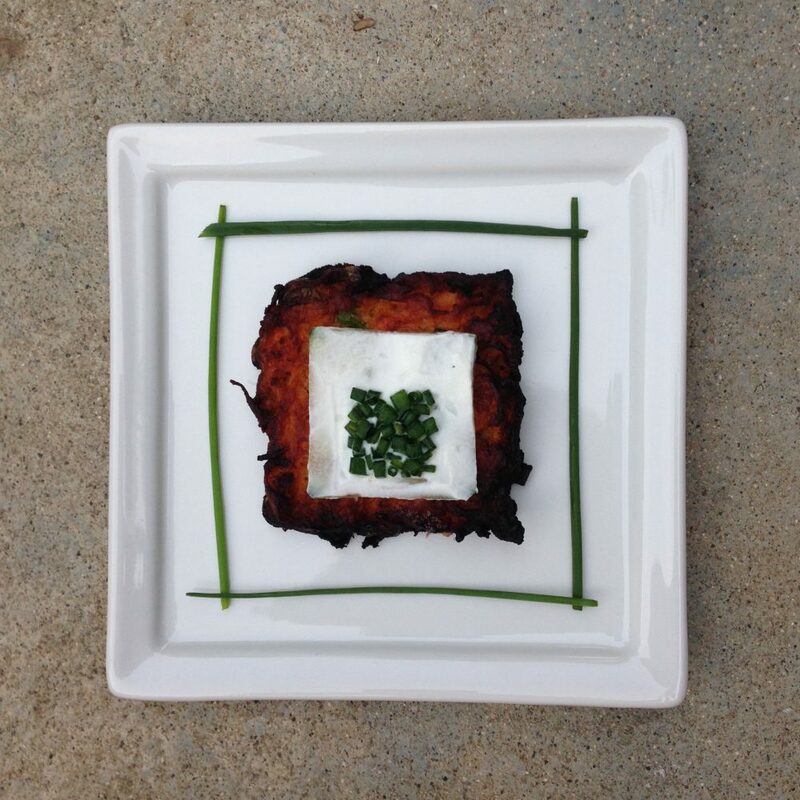 These sweet potato latkes, inspired by Albers’ rigid squares, make a big statement. The recipe is fairly simple, but getting the shape just perfect takes a steady hand and a bit more patience than usual. A handful of the steps can be done ahead, and, unlike many latkes, these are pretty delicious when they’re not piping hot, making them a perfect choice for an amuse-bouche at your next formal dinner or cocktail party. Let these elegantly plated tasty bites kick off the night’s entertainment right. Boil the sweet potatoes in a large pot of water for about 15 minutes. Remove the potatoes from the water and refrigerate them until cooled, about one hour. Grate the sweet potatoes with a coarse grater and place in a bowl. Add green onions and softly mix to combine. In a separate bowl, whisk eggs until well mixed. Add in flour, salt, and pepper, and whisk again. Add egg mixture to potatoes, and gently stir until well incorporated. Place the square mold of your choice on a sheet of foil and gently spoon enough potato mixture into it to fill the bottom, about one half of an inch. Do not overfill here; thinner is better. Distribute the potato mixture by gently pressing it into the sides and corners of the mold. Move any green onions away from the corners and edges. Heat oil in a pan over medium-low heat. To test for readiness, place a toothpick in the oil and look for small bubbles. Gently slide a spatula under the mold with the potato mixture inside. Once the mold and the mixture are on the spatula, carefully remove the mold. Repeat steps one through five, until the pan is full. Add more oil as needed. As each latke begins to solidify and brown, carefully turn them to cook the other side. Once cooked through, remove latkes from heat and place on paper plates to absorb the extra oil. The latkes firm up a bit as they cool. Leave at room temperature or refrigerate, if making ahead. The latkes can be easily reheated in the oven. Use a mandoline or knife to thinly slice a cucumber to make as many slices as you need—one per latke. Cut the cucumber slices into squares, according to the size of your latkes. The cucumber slices should be smaller than the latke, but large enough to fit squares of Greek yogurt and chives on top of them. Spread a generous, but even, layer of Greek yogurt on each cucumber square. Using another square mold that’s smaller than the cucumber slice, carefully sprinkle finely chopped chives onto the surface of the yogurt. If your chives go cattywampus, use a sterilized pair of tweezers to straighten them. You can also use a small knife to sharpen up the square’s edges. Place each chive-garnished cucumber slice very carefully onto a square latke. Serve latkes one to a plate—square plates preferred. They also look great served on a cocktail napkin or a small square piece of origami paper. For the chive border-effect shown above, trim chives to the appropriate lengths and frame each latke by overlapping the chives at the ends to form a square. Resist the urge to flatten the latkes as they are frying, as this will puff the sides out and you’ll lose the rigid sides of the square. While the latkes are in the pan, if they lose shape at any point, use a small knife to gently push in the sides to help re-establish the square edges while bracing the latke on the opposite side with the spatula. Hold the cucumber slices in your hand when spreading the Greek yogurt.. This allows you to maneuver easily. You can run the spreading knife around the edges of the cucumber square to clean up any extra yogurt. The most painstaking part is making that tiny chive square. Don’t lose your mind—embrace the insanity and know that those tweezers are your best friend.